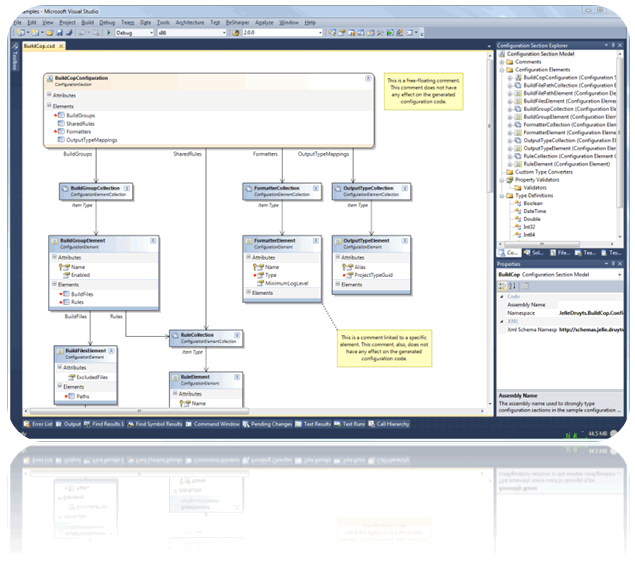 Want to be notified of new releases in hybridview/ConfigurationSectionDesigner? Updated package version for release. Moved from CodePlex, which is closing. To Download the Compiled Extension: Click the Releases tab. A Visual Studio add-in that allows you to graphically design .NET Configuration Sections and automatically generates all the required code and a schema definition (XSD) for them. For installation, usage instructions, and more info, see the project Wiki. I have very little time to maintain this at the moment, so please feel free to fork and submit PULL requests. If you are providing good quality contributions and would like to be added as a maintainer of this project, let me know. Thank you! Ability to support AspNetCore JSON configuration/options. More customization ability for generated code.